He's been around for quite a while. In all, he has been in eight of Sayles' movies, including 1988's "Eight Men Out," in which he played pitcher Eddie Cicotte, and 1992's "Passion Fish," in which he played the romantic lead. His other movie credits include Patchett the pimp in "L.A. Confidential" (1997), Tom Cruise's brother in "The Firm" (1993), and Meryl Streep's husband in "The River Wild" (1994). Under the direction of the late Christopher Reeve, he played the father of an AIDS-stricken son in the HBO movie "In the Gloaming" (1997). If you were a fan of the old TV series "The Days and Nights of Molly Dodd," you saw him in a recurring role as Moss Goodman, the guy who sold books. 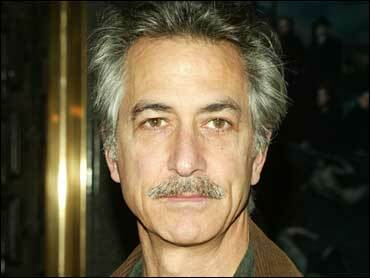 See photo essay for more pictures of David Strathairn. See Real To Reel to compare Strathairn's portrayal of Edward R. Murrow with the real deal. See "Good Night, and Good Luck" interactive for video clips from the movies, interviews with stars, and more about the stars of the film. Strathairn, 57, also appeared on Broadway in "Dance of Death" with Ian McKellen and Helen Mirren (2001-2002) and in "Salome" with Al Pacino and Marisa Tomei (2003). Earlier, in 1997, he shared a stage with Billy Crudup, Paul Giamatti, Calista Flockhart and Lili Taylor in a revival of Anton Chekhov's "Three Sisters." And a bit of trivia: He studied at Ringling Brothers and Barnum & Bailey Clown College and followed it up by working as a circus clown for six months. Strathairn lives in upstate New York with his wife, Logan. They have two sons.